She's known for her biscotti and fresh cheeses. And, Chef Gina's Homemade products are a local favorite. Her products are a favorite at the Scottsdale Farmer's Market but she can also be found at the Palo Verde Square shopping complex on Frank Lloyd Wright Boulevard (just north of Shea). 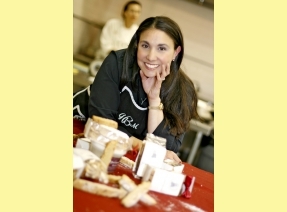 Many of Chef Gina's products are also sold at AJ's and Whole Foods, and all of her yummy food is still available at the local farmers markets. A growing number of Gina's Homemade products are also being used by local restaurants, including Beckett's Table, Praying Monk and Prado. I'm Italian - it's a well documented genetic disorder. We come out of the womb like this and it only gets worse with age. When we're not eating we're thinking about eating and when we are eating we are talking about what we are going to eat next. That's easy - my mother's kitchen. She knows everything like she make it the way I like it and best of all, I don't have to cook it. Your going to laugh, but my favorite dessert is cheese. I love it. A nice cheese plate and a glass of wine - that is my dessert. I'm a traditionalist so my favorite things to cook are pastas and rustic peasant dishes like escarole and white beans. What ingredients can you not do without when you're cooking? Olive oil and garlic. Those are my staples. What's the most basic advice you give when you're talking to someone about cooking? Take it slow. It's not that hard - just learn to do one thing well and go from there. We love it. We love our local farmers especially McClendon's Select - they are great at what they do and they make us look good when we cook with their vegetables. wSimple and fresh - if you keep your food simple and fresh most everything else will work itself out. What do you consider unique to Arizona when it comes to food, restaurants and/or anything related? We actually have a remarkable diverse food scene and it starts with Arizona agriculture with the farms and ranches in the south and all around Maricopa Country. And Arizona's best restaurants rival anything in the country. Mash avocado. Add remaining ingredients and mix well. Serve as a dip with tortilla chips.